True love has no bound, not even when your favorite NFL teams are rivalries! For Annie and Peter, their love for each other is greater than their love for their teams (the Carolina Panthers and the Atlanta Falcons), not to mention they are super fun and absolutely a joy to photograph! 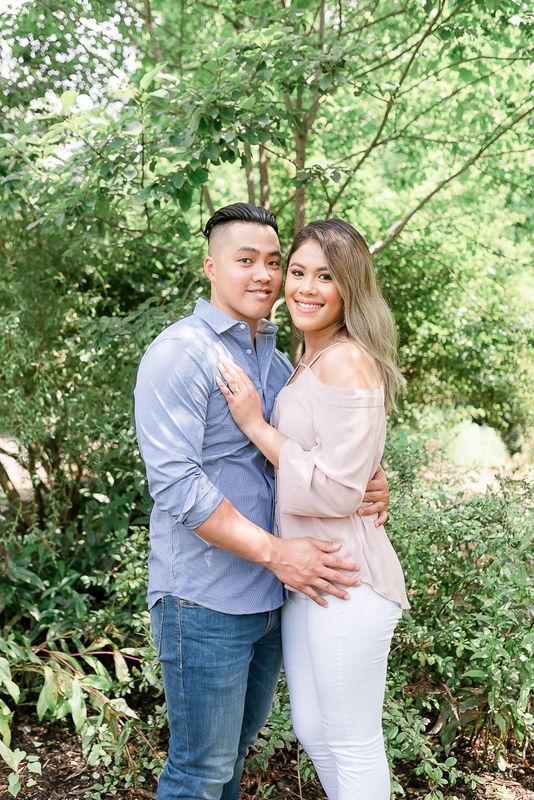 After years of dating, Peter planned a surprised proposal when he suggested to Annie taking a walk at Brookside Gardens, which according to Annie, is something that they almost never do! Without knowing that Brookside Gardens was supposed to close early, Peter hurried Annie and that really annoyed her because she didn't really take a walk in the first place! 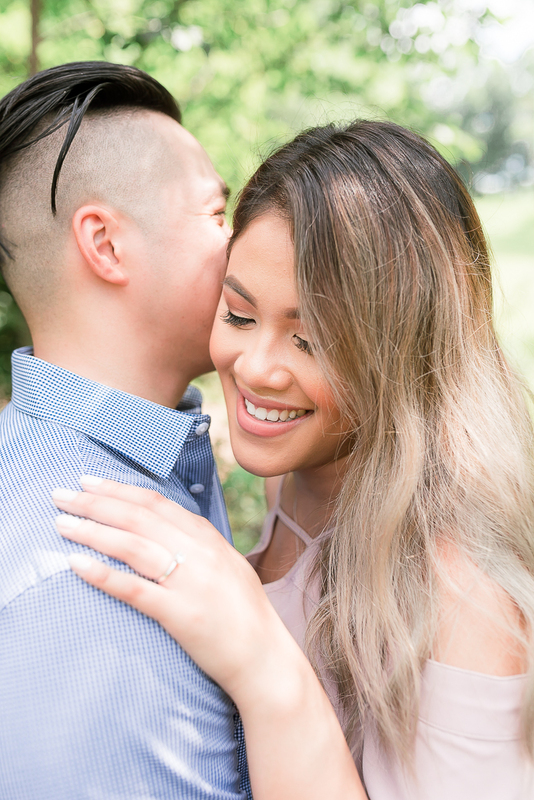 When they finally made it to the pavilion, Peter got down on his knee and proposed to Annie, to which she responded with disbelief, because she didn't dress for the occasion (as she was wearing gym clothes for "the walk") and her nails were done! Nevertheless, she said yes to Peter, and the rest is history! 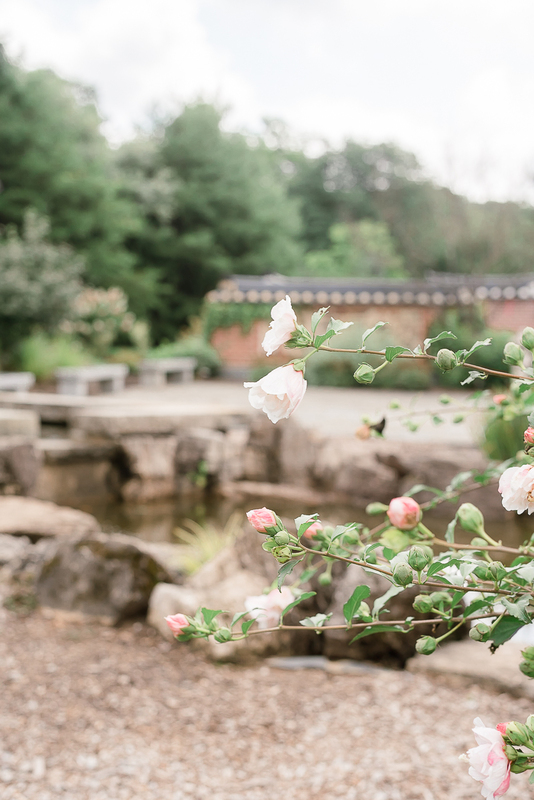 For their engagement session, we decided to take a stroll at a similar setting at the Meadowlark Botanical Gardens at Vienna. Annie's bright red dress and Peter's blue shirt and red tie matched perfectly and created a pleasant contrast to the luscious green vines at the Korean garden and bell. Afterward, they switched to their casual outfits and we walked around the lake and hung out at the pavilion. Throughout the whole session, you can tell Peter knows how to make Annie laughs, and their laughter is absolutely contagious! Annie and Peter - it was so much fun hanging out with you both for your engagement session, and I can't wait for your wedding day to come!